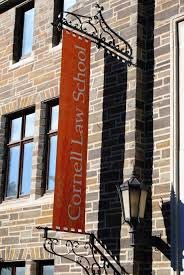 Order in the Cornell court! I like to act like someone I’m not. Someone quite possibly guilty of a horrible crime. Arguing with overzealous attorneys is my idea of a good time. If I were to get selected for jury duty, I’d probably be pretty pleased. I'm not some weird, punishment-loving person (well, I do go to Cornell...), I just love mock trial! Over the past month, I’ve spent more time than I’d like to admit reading affidavits, revising direct examinations, and listening to opening/closing statements. I’ve been in a suit so much that you’d think I was a walking Brooks Brothers advertisement. I’ve skipped dinner, told friends “another time,” stayed up way past my bedtime, and forwent Halloween (my favorite holiday) so that I could talk about fake people's fake problems in their fake world. But to my teammates, mockers across America, and me, it’s all very real. We signed up for the sweaty palms and way-too-long weekends voluntarily. And, surprisingly, we have a blast doing it. 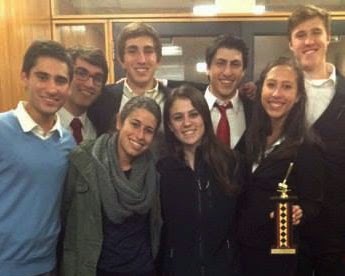 This fall, our team went to two invitational tournaments at Columbia University and Brandeis University. for a day in court. 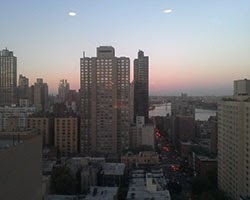 Columbia commenced with a bus ride into the city. After schlepping our bags through the streets, we arrived at a teammate’s apartment where we would be staying for the weekend. Late nights of practicing and “team bonding” melded into bright and early mornings hailing a cab from the Upper East Side to Columbia’s campus. Our rounds sped by as we patched our arguments between trials. Columbia's tournament was a learning experience for us new kids on the block, and gave us something to build on with advice from the judges. to the law school. And completely changed everything that I had memorized about my character, as is customary in mock trial. We roadtripped it up to Boston for Brandeis with experience on our side. We must have learned something, for we exited the bracket with a 7-1 record! At the awards ceremony, we were saddened to find out that we tied for first place, but received second due to a technicality in scoring. Nevertheless, we returned home with the radio blaring and our pride well-intact. All of that preparation and stress for two weekends of competition. Now that the invitational season is over, we can all let out a collective sigh. With relatively so much more time on my hands, I felt like a void had been left in my life. Looking back, I ask myself, why did I do that? Why did I spend so much time secluded from real life in cramped classrooms? The glory? I can assure you there is zero glory in mock trial. In reality, I did it for the snarky giggles that I can share with my teammates about what opposing council is wearing. I did it for the stories about how that attorney tried to impeach me, but looked like an idiot scrambling though exhibits and decided to just give up. I did it for the team dinners and backseat sing-alongs. I did it for the people and the friendships. Mock trial has been a part of me since high school. I was on the fence about whether or not to even try out for the team once I got to college. In retrospect, I’m glad I went for it and devoted so much time to this organization. I've had some of my best experiences and made some of my best friends through mock trial so far in my short undergraduate career. Here’s my monthly (cheesy) advice to you, dear reader: The next time that someone tries to badger you into coming to watch them argue a fake case, don’t object. The evidence goes to show that you might “witness” something surprisingly interesting.